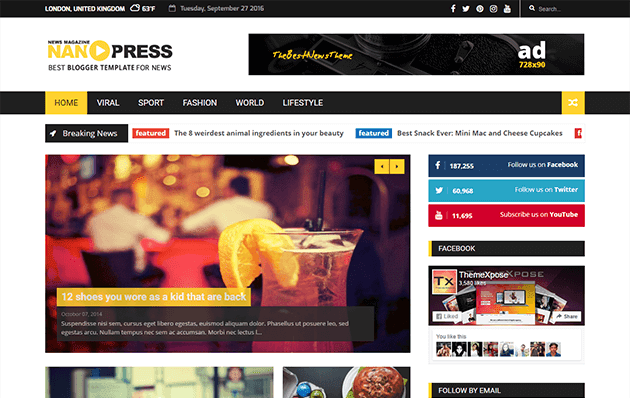 Nanopress is a simple, user friendly, feature-rich, fast-loading, customizable, functional and modern Blogger news, newspaper, magazine, blog and publishing Blogger Template. This template is fully responsive, fits any size of display from lower to higher resolutions and supports all modern browsers. This template is SEO-ready and provides a great platform to achieve super high search engine rankings for your website. This theme has new feature - weather status. Its comes with Two Layout - with Slider, with Featured Grid. Imp : If you make your blog private then this template doesn't work.